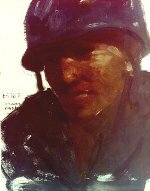 The predominantly Puerto Rican 65th Infantry Regiment was honored in a 1992 Army National Guard heritage painting for its record of valor during the Korean War. 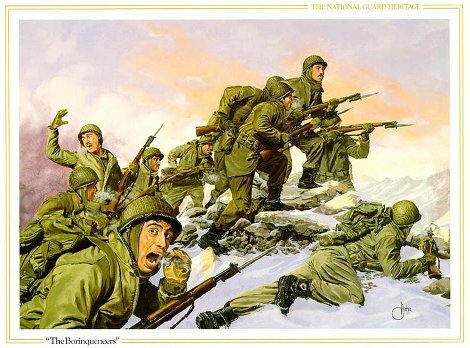 The scene depicts the regimental bayonet charge against a Chinese division near Seoul, South Korea, on Feb. 2, 1951. The 65th had been ordered to seize two hills and climaxed a three-day assault by fixing bayonets and launching straight into the Chinese 149th Division. The enemy soldiers fled. The 65th was organized in 1899, a year after the United States seized Puerto Rico from Spain. At the time, the Army considered the regiment to be "colonial troops" for the defense of the island. In 1908 the regiment was attached to the Regular U.S. Army. Its nickname, "The Borinqueneers," honors our native warriors. 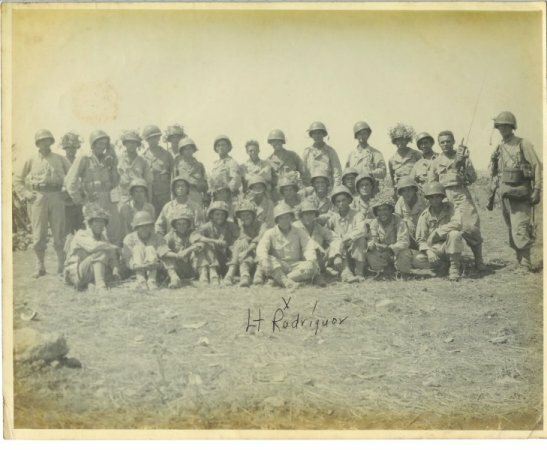 In August 1950 the Korean War was less than two months old, and Puerto Rico's 65th Infantry Regiment was on its way to the combat zone. The regiment landed at the port city of Pusan on the Korean Peninsula's southern tip, where U.S. forces had been holding a perimeter against the Communist North Korean invaders. Sent into action immediately, the Puerto Ricans took part in the U.S. breakout and drive to the north. Following the brilliantly planned and executed surprise landings at Inchon, U.S. and other United Nations forces drove deep into the mountains of North Korea. At that point a huge Chinese Army entered the war. The U.S. Eighth Army was overrun, and the 1st Marine Division, with attached U.S. and British Army Units, was completely encircled. In one of the greatest fighting retreats in history, the outnumbered Marines battled their way south to the coast. The first friendly troops they saw on the frozen ridgetops were the Puerto Ricans of the 65th Infantry Regiment, sent to hold the perimeter around the vital port of Hungnam. The Puerto Ricans supervised the evacuation of Hungnam, finally sailing themselves on Christmas Eve, 1950. The 65th landed in Pusan as they had five months before, and again fought their way northward. Late January 1951 found them south of the Korean capital of Seoul, under orders to take two hills being held by the Chinese 149th Division. The assault began on on January 31st, and took three days. On the morning of the third day the top of the hills were within reach, and two battalions of the 65th fixed bayonets and charged straight at the enemy positions. The Chinese fled. During its service in Korea, the men of the 65th Infantry won four Distinguished Service Crosses and 125 Silver Stars. The "The Borinqueneers" were also awarded the Presidential and Meritorious Unit Commendations, two Korean Presidential Unit Citations and the Greek Gold Medal for Bravery. The 65th Infantry Regiment's gallant service in a difficult war is exemplified by its regimental motto, "Honor and Fidelity," and the regiment itself exemplifies the National Guard's leading role in our nation's military history. of his men was Carmen's father, Corporal Antonio Santos (Silver Star). This photo was not dated, probably circa 1945. Lt. Rodriguez was Ivonne Figueroa's (editor) Padrino. He was known for his beautiful poetry. "Mission Accomplished" is the name of this monument to the 65th Infantry (The Borinqueneers) of Puerto Rico. The batallion was formed on May 20th, 1899. The soldiers in this US Postage Stamp are actually Puerto Rican Reserve soldiers serving in the 65th Infantry Regiment. The stamp is representative of the Korean Conflict. If you would like to purchase this hard-to-find stamp, El Pozao Productions has a limited quantity available for $5.00 each (including shipping and handling). You may send your check or money order to: El Pozo Productions, P.O. Box 302, Crompond, NY 10517. The stamp and other merchandise (such as the DVD of the documentary film, cap, books, etc) can be purchased by visiting www.borinqueneers.com. Literal translation by Juan Carlos Ramos . . . .
Get up boys, we are shipping out. To far away lands we must go and fight. Through the paths of law and righteousness our Borinquén Regiment marches on. For our motherland we wil give it all. For parents and sibilings that remain behind. For my sweetheart, my son and my God. To my beloved island we bid farewell. Goodbye beloved land of my aspirations, don't forget this child that now leaves you, in your prayers. While I, during my nights of sorrow, will alleviate my saddness and anguish with my songs. Win or lose, We fought with bravery. Our Regiment covered itself with honor. 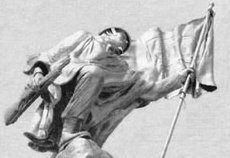 In over a thousand combats and hundreds of battles, with our face to the wind, the Regiment of my Borinquén marched on. This song became a hit during the Korean Conflict in 1952 and for the remainder of the conflict. Like Vietnam it was never called a war. The song was made popular by El Trío Vegabajeño, three Boricuas that sang, just as good as Los Panchos, during their peak of popularity. Juan Carlos Ramos . . .